Crowdsourcing Legal Project Management: How to get started? Embedding project management in a law firm is a challenge for many, but not because the subject is difficult or the technology to support it is in its infancy. The greatest obstacle is the average partner's perception that project management applies primarily to repeatable, commodity, low-cost legal practices. 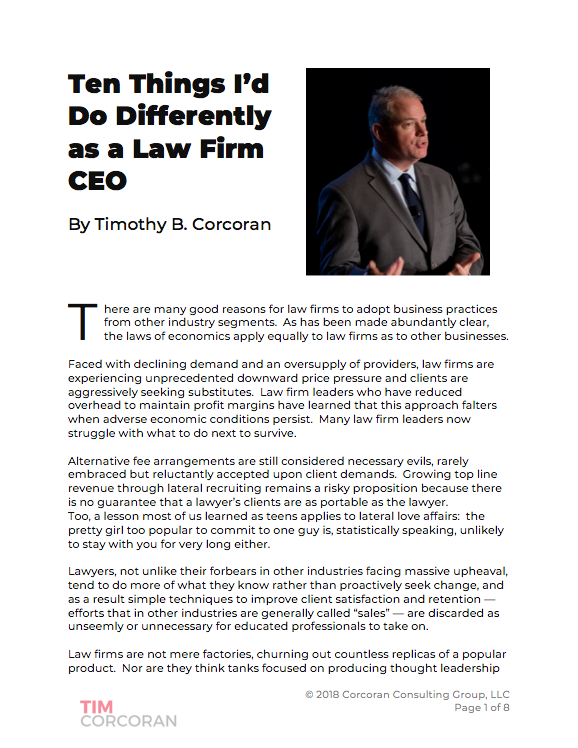 When the lawyers are asked, or even forced, to adopt a new business process that feels inconsistent with how they practice law or earn a living, there is natural resistance. The best project management programs start, therefore, with partner education. Once partners recognize two key economic drivers, they often accelerate their adoption of project management principles. The first driver is that regardless of billing type – hourly or non-hourly – and regardless of price sensitivity, the path to maximum profitability is to lower the cost of delivery, and this is done by finding efficiencies. Lawyers should have embraced project management long before the economic downturn, but doing so now can quickly improve declining financial performance. The second driver is client satisfaction and retention. With clients increasingly demanding matter budgets, those lawyers who can deliver predictability in legal costs with confidence will improve client satisfaction and earn multiple repeat engagements, even as the competition endures RFPs and competitive bidding processes. Project management is perceived by some to be an approach that primarily benefits clients. While clients indeed benefit, the greatest beneficiaries are the lawyers and the law firms. Once this is clearly demonstrated to the partners, most firms can't move quickly enough to embed project management into the firm's operations. The reality is that project management works. Partners raised on "law as art" resist this notion because they often equate LPM as part of the movement toward "law as commodity." Nothing is further from the truth. LPM can actually elevate law, particularly the law needed in commercial business transactions and litigation, from a costly, necessary evil that business leaders avoid at all costs to a strategic initiative. If a business leader has improved awareness of business risk, has a broad understanding of the costs and impacts of various alternatives for business growth, and can proceed with confidence while competitors proceed timidly due to uncertain costs and risk factors, this provides a compelling strategic advantage. Skeptical law partners reading this likely have 20 or more objections to the ideas offered in this ILTA blog series. With all due respect, others have raised these objections previously. Long before you. And yet, many partners have proceeded to vigorously embrace LPM into their practice. Do you really think they're choosing to make less money, that their practices are comprised solely of repeatable commodity tasks, and that their clients are focused solely on cost instead of value? Perhaps it's time to revisit your assumptions. The answers are out there. What are you waiting for? Read the other contributions here.